LEFT: broken surface, RIGHT: cut surface. Thanks to Eben Franks, I know this is from the Mid-Atlantic Ridge – Research Vessel Knorr cruise 180. Coordinates: 2. 23.5° North and 45° West. Cruise was Nov. 14 to Dec. 17th, 2004. Age: between 1.5 and 2.5 million years. Buckets of slurry Eben brought me he described as, "Glop from rock saws, high in manganese. 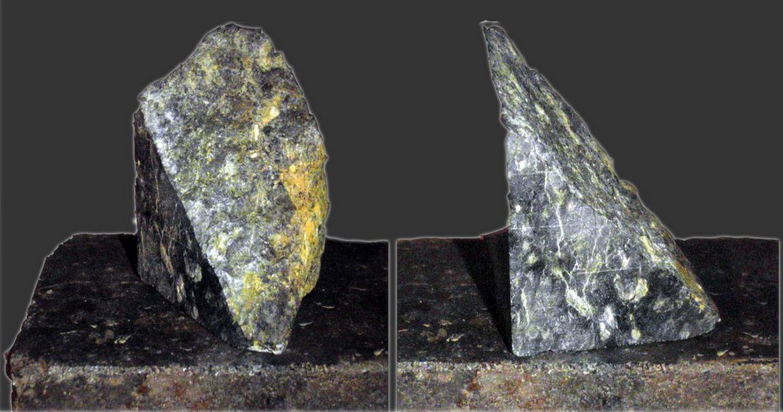 It has lots of peridotite, serpentine, basalt, and olivine gabbro. It is mostly volcanic in nature". Photos at left show versatility of this one material; it can be sheer and revealing of porcelain clay surface and it can be dense and rock-like on porcelain. Photo at right shows how a ppikle of gooey slurry contracted first when water evaporated and then, in the kiln, it self-sorted into brick-like shapes.